Boca Grande is named the Tarpon Capital of the World for a reason. There is no other place in the world like it. Each year in the spring thousands upon thousands of adult tarpon migrate here to spawn out of Boca Grande pass. Tarpon must have a deep water pass to reproduce out of and this is the epicenter of all spawning activity. Casting a crab along the shallow water beaches to massive schools of tarpon and watching them dance their way out of the water away they have been hooked is a rush like no other. Our migrartory fish are here from April to Mid july and most fish range from 60-180 pounds. 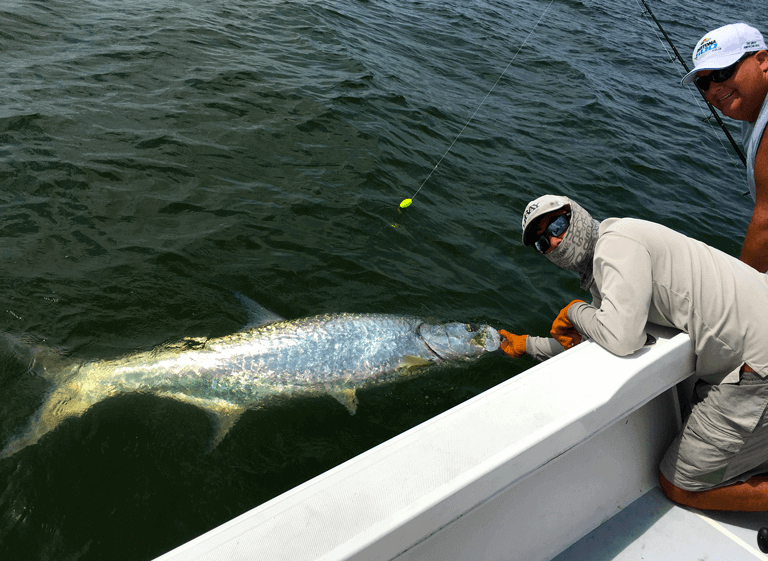 Some of the best tarpon fishing can happen in August through October when the tarpon move back into Charlotte Harbor and the mouths of the Peace and Myakka Rivers. On days like this it is not uncommon to hook 6-10 fish in a trip. On a backcountry fishing trip you will get to experience some of the most productive and Finest Flats Fishing Florida has to offer. Snook, redfish, trout, pompano and flounder will consist of main targets depending on the time of year that you book your trip. Anything from sight fishing redfish in shallow water to live baiting big schools of snook in the crystal clear waters of our passes could happen on one of our backcountry trips. Right off our area beaches we have some Incredible Nearshore Fishing! Species include Permit, Kingfish, Grouper, Snappers, Triple tail, Bonita and sharks. With wrecks and reefs scattered all throughout our region we can be catching a multitude of tasty fish in one trip most of the time staying in sight of land. All fishing licenses, required tackle, & bait are provided. I will also supply a cooler & ice for you! Please bring plenty of drinks and snacks for yourselves. I highly reccommend a quality pair of polarized glasses, along with your favorite camera!